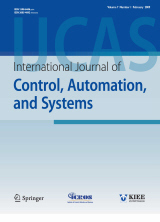 Abstract : "This paper investigates automatic UAV carrier landing using model predictive control that considers carrier deck motions. With dynamic models of a medium-altitude, long-endurance UAV and an aircraft carrier, the proposed guidance and control approach takes the relative geometry between the UAV and the carrier deck into account for safer shipboard landings. Automatic carrier landing is performed sequentially by two types of control systems. A linear quadratic regulator with an integral term is applied up to a few seconds before touchdown followed by a model predictive controller. At this time, optimal control input sequences over a certain time horizon are calculated in real time by predicting the motions of the carrier deck and the UAV. Numerical simulations are performed for a UAV and a carrier with heave motion to verify the feasibility of the proposed approach. " Keyword : "Automatic carrier landing, linear quadratic tracker with integral, model predictive control, unmanned aerial vehicles. "